Hutch Adds Overhead Storage To Lorell Chateau Series 70-7/8" Wide Desks Or Combined Worksurfaces. Chateau Offers Contemporary Laminate Office Furniture With A Durable Design And Multiple Configuration Options. Top Features Reeded Edge Detail For A Distinct Look. 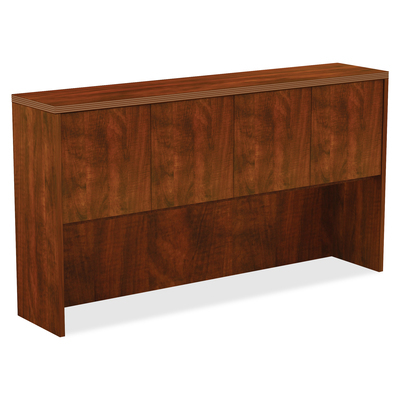 Design Also Includes A High-Quality, Cherry Laminate Surface For Durability, Backing And Four Doors To Provide Privacy To Two Compartments..
Hutch Adds Overhead Storage To Lorell Chateau Series 70-7/8" Wide Desks Or Combined Worksurfaces. Chateau Offers Contemporary Laminate Office Furniture With A Durable Design And Multiple Configuration Options. Top Features Reeded Edge Detail For A Distinct Look. Design Also Includes A High-Quality, Cherry Laminate Surface For Durability, Backing And Four Doors To Provide Privacy To Two Compartments.